Salt & Oil Content: Oil and Salt content in this Rajapalayam Mango pickle is less when compared to any other pickle. Due to the lengthy sun drying process which is a great preservation method, there is no need of too much oil and salt for the pickling process. Usage Instructions: This unique pickle goes well with a diverse range of cuisines – Have it with any South Indian rice or tiffin items like Idly, Dosa, Upma etc; with Paratha, Chapathi & other North Indian Breads; mix it with any sauce or soup for a great flavor; spread it on a toast or a French Baguette; Mix it with curd for a great Pickle Raita or dip; mash it and use like a sauce or chutney to go with any world cuisine. A really versatile Pickle! Storage & Precautions: There is no need for Refrigeration. Refrigeration not required even after opening. Always use a clean and completely dry spoon. Please store the Pickle Jar/Bottle in a dry place. Consume pickles in moderation. This Pickle will be available anytime of the year except in the months of April, May and June depending on the stocks. Shipment Time: 2-3 days for dispatch from the date of Order Confirmation subject to stock availability. We have partnered with a reputed logistics partner and we deliver across India to all metros and certain non-metro cities as well. Packaging & Shipping Cost: We use only Glass Jars/Bottles for most of our products. The products are carefully packed for safe delivery and the packaging charge is included in the total cost of the product. Delivery Time: 4-7 days for delivery to Metro cities and 7-15 working days for Non-Metro destinations.Delivery by Road. This traditional pickle has been especially handmade by Chinmaya Arjun Raja and his mother Prabavathi Arjun Raja of Rajapalayam, Tamil Nadu. For more information on the family food artisans please read the FAMILY MADE page. The recipe for this pickle has been passed down among the Rajus since 1500 AD when they first migrated to the Madurai region and then Rajapalayam in Tamil Nadu from the present-day Andhra and Karnataka regions during the reign of Sri Krishna Deva Raya of the Vijayanagara Empire. This pickle follows a recipe that has been with the Arjun Raja family in Rajapalayam for nearly a century – and honours the original recipe and the various changes it has undergone over the past five centuries. Pickles made by families continuing their community culinary heritage since generations. Made with fresh local produce and quality ingredients, they are all handmade, homemade and hygienically bottled by families following their traditional and authentic recipes No added preservatives, colours, flavours or taste enhancers. Most of the Mango pickles are sundried and hence have a long shelf life. They go through a fermentation process as well. They need not be refrigerated. 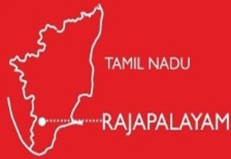 Rajapalayam Mango pickle is unique to the Telugu-speaking Raju community of Rajapalayam, a town renowned for its mangoes located 85 kms south of Madurai, near the Western Ghats in Tamil Nadu. 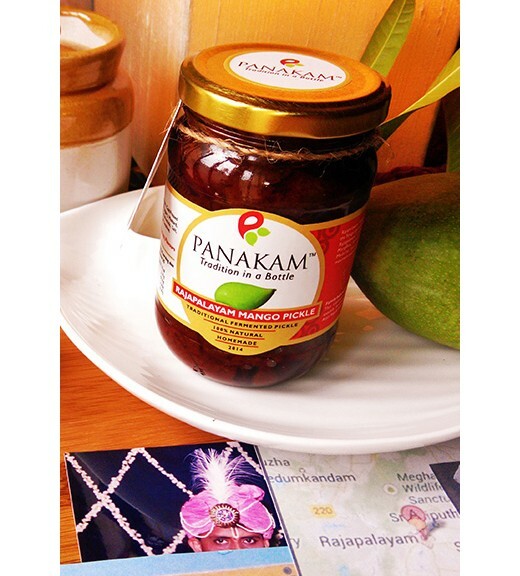 This Pickle is part of the Traditional Community Based Geographical Origin Pickle offerings from Panakam-Tradition in a Bottle. Pickling is a collaboration between tradition and nature that combines preservation methods and fine ingredients while letting nature do its magic. Handpicked raw mangoes from the groves of Rajapalayam are cut, sun-dried and pickled using traditional fermentation methods. A blend of fine spices, oil and other ingredients is added in an elaborate process and the pickle stored for a few months before bottling. This naturally pure, authentic and healthy pickle has a fine balance of spices, salt, sweet and acidity—and a uniquely smooth texture. Mango Varietal used: The popular Mango variety Kili Mooku (Tamil) also known as Totapuri/Ginimoothi/Collector/ Bangalora in other parts of South India is used for this Rajapalayam Mango Pickle. It is also called as Aaramunji Mango in Rajapalayam. The Family Mango Orchards is near the foothills of the Western Ghat mountain range near Rajapalayam. Expiry: 12 months from the date of packaging and 18 months from the date of manufacturing under ideal storage conditions. Personal Note from the Pickle maker – Due to food safety rules we have to mention the “Best Before date“ as 12 months from the date of packaging and 18 months from the date of manufacturing. But families making this traditional pickle prefer having it after 6 months to one year of manufacturing date as the mango pieces absorbs all the spices and tastes best. These pickles last for even 2 years or more if stored well and precautions followed.